before the cleaning carried out in the 19th century by archaeologists and engineers, the Colosseum had been overgrown with plants and trees. For a long time there had been orchards and gardens, and in the dark of the arches or clinging to the top of the walls could be found all kinds of plants. Fig trees, elms, pear, olive and cherry trees found their habitat in the amphitheatre, where sheep grazed in the arena. The greenery was so abundant that in many cases, e.g. in 1727, permission (under payment) was granted to collect the hay and the herbs growing in the monument. 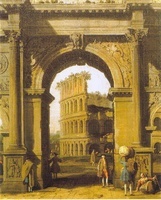 Left: a vision of the Colosseum through the Arch of Constantine, by Canaletto. Click here to see the real perspective. 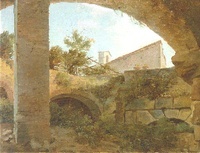 The arches and the ruins had become an enchanted garden full of flowers and greenery. Romantic travellers of the XVIII century found the Colosseum extremely suggestive, as if nature had again taken possession of the place. Models of the amphitheatre started to be made and sold all over Europe. Shelley, Byron, Dickens, Thomas Cole, Henry James and other innumerable artists fell in love with the fascination of the old, evocative ruins. 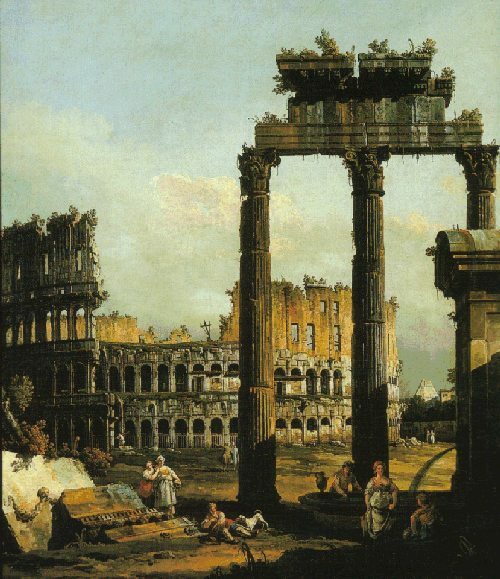 18th and 19th century painters were especially fond of the picturesque aspect of the Colosseum. French painters Jean-Antoine Constantin and Francois-Marius Granet, who worked in Rome between 1777 and 1830 left many pictures of the amphitheatre covered with greenery. 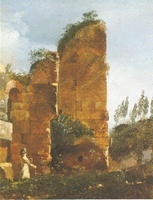 It is interesting to read about the attitude of Granet when, on his return to Rome in 1829, visited the Forums and the Colosseum and was terribly disappointed by the work of the "engineers" who were cleaning and restoring the old stones, removing away weeds and trees: "I was amazed that the Romans, who have such a taste in all things, could have allowed such a slaughter. Modern works ruined those wonderful monuments". And on another occasion: "It has been Science and its cold rules that have reduced the place in such a state that the Art of painting weeps". The flora of the Colosseum has been studied scientifically five times in different works (Panaroli 1643, Sebastiani 1815, Deakin 1855, Fiorini Mazzanti 1874 e Anzalone 1951), which shows the special interest of the botanists for the Colosseum and the urban flora. Domenico Panaroli, died in 1657, was professor of botanic and anatomy at the University of Rome "La Sapienza" and director of the Rome physic garden. His list of 337 species of the Colosseum (Plantarum Amphytheatralium Catalogus) was meant to demonstrate how medicinal plants could be easily found anywhere ("plantas familiares, & domesticas, quas pedibus quotidie calcamus enumerabimus..."). 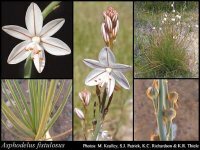 The terminology is pre-linneian, so there is some ambiguity about the identification of the species. Antonio Sebastiani (1782-1821) was a doctor of the Ospedale del S. Spirito di Roma, professor of botanic at Rome University and director of the botanical gardens from 1813 to 1820. In 1815 he published a catalogue of 261 plant of the Colosseum: "Enumeratio Plantarum sponte nascentium in ruderibus Amphitheatri Flavii". Also this work was finalised to study medicinal plants "ad communem omnium utilitatem". Here the terminology is both pre-linneian and linneian. We know very little of Richard Deakin, who died in Tunbridge Wells in 1873. He was a doctor in Sheffield and studied botanic. He wrote: The Botanist's Manual in 1836, a Phlorigraphia Britannica in 4 volumes published between 1837 and 1848, Ferns (1837-1841), Flora of the Colosseum of Rome in 1855 and The flowering plants of Tunbridge Wells and neighbourhood in 1871. 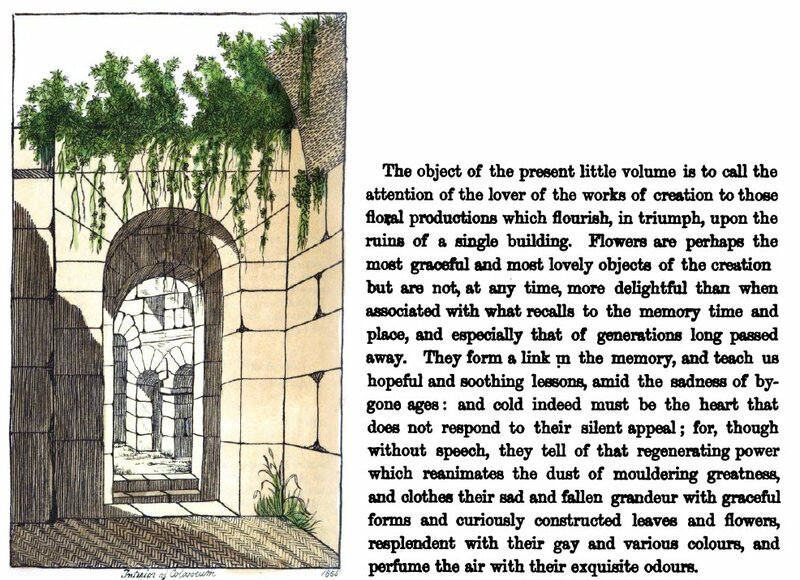 Flora of the Colosseum of Rome was first published in London in 1855 and republished in 1873. This work was destined to the English public who appreciated the romantic side of the Colosseum, described many times by famous writers and poets. The object of the book was not only scientific, but also educational and even poetic, as explained by Deakin in his preface, reproduced below. 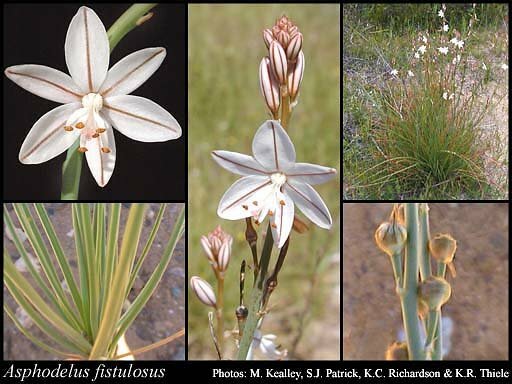 In his work Deakin described the properties of each plant, its practical uses, the traditions connected to it in the different cultures and even mythological references and literary citations. Countess Elisabetta Fiorini Mazzanti (1799 - 1879) was an Italian botanist who studied in deep the plants of Latium. In 1875, before the massive cleaning of the monument, she published Florula del Colosseo, a study divided into five "communications to the Accademia Pontificia de' Nuovi Lincei. Florula was conceived "in order not to forget the memory of the plants that took root there", which is evidence of the appreciation of the botanists - and not only them - for the greenery that covered the monument. 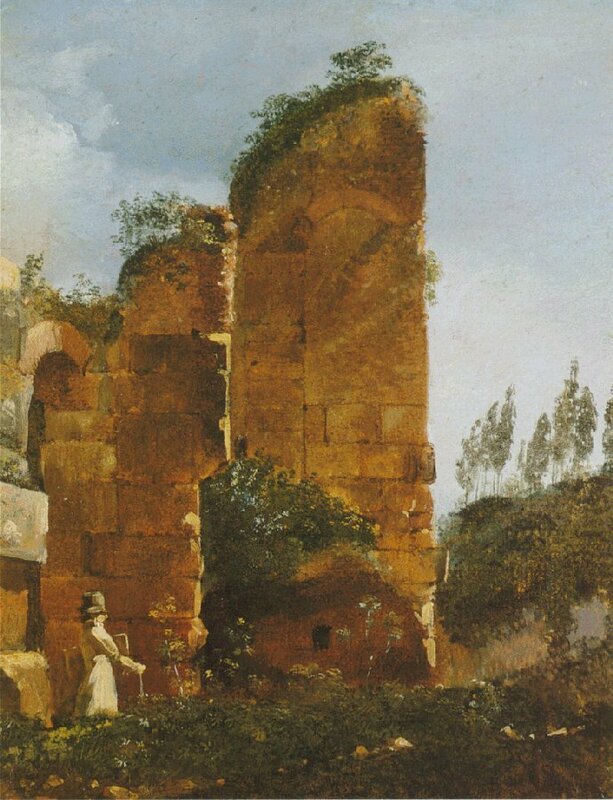 In the preface Fiorini shows all her sadness for the weed killing operations: "Nature liked to dress poetically the venerable walls, by mitigating their sternness with the graceful ornament of plants and flowers ... now archaeological cupidity has destroyed everything". Fiorini's work, more scientific than the former ones, lists 272 species, among which 70 species of "lower vegetables", which are now considered to belong to different kingdoms: moss, lichens, mushrooms etc. Bruno Anzalone (1921-2007), professor of Botanical Pharmacy from 1974 to 1996 at Università La Sapienza in Rome, was considered the greatest expert on the Latium flora. In 1951 he published "Flora and vegetation of the walls of Rome", which also included the Colosseum and listed 191 species. In recent years, a survey of the current flora of the Colosseum was carried out by the Università La Sapienza of Rome between 1990 and 2000, taking advantage of the scaffolding placed for restoration works so as to reach otherwise inaccessible spots. The flora was surveyed at all the levels of the amphitheatre, from the fresh and damp hypogea up to the upper floor, dry and sunny. On this occasion were counted 243 species, of which 169 in the hypogea. 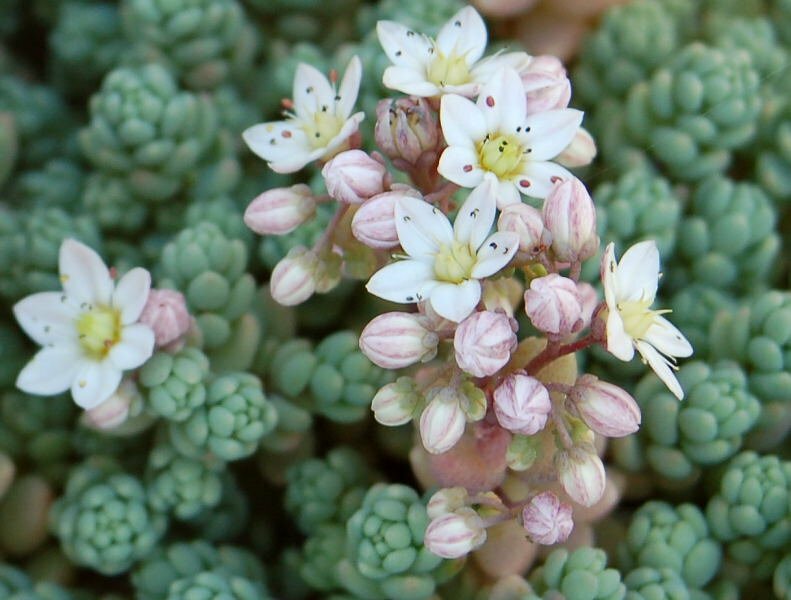 Also very rare species were found, like the Asphodelus Fistulosus e il Sedum dasyphyllum (see pictures). This should confirm that archaeological areas are a sanctuary for species threatened by the urban environment.